Europe is certainly getting tougher on China. Spooked by a flurry of Chinese acquisitions on the continent, the EU and several of its member states have tightened restrictions on foreign investment over the past year. And some of Europe’s biggest countries are now considering excluding Chinese telecoms firm Huawei from the development of their next-generation 5G mobile networks. But as on so many other issues, Europe is divided about how to respond to a bolder, brasher China under President Xi Jinping. While Germany, France, and Britain have grown more skeptical, Italy’s new government is moving in the opposite direction, while countries like Hungary and Portugal remain quite China-friendly. None of Europe’s leaders want to go down the confrontational path with China that Donald Trump is taking. One of the biggest concerns in Berlin right now is that China hawks in Washington could start an economic Cold War with Beijing that would force Europeans to choose between their two biggest trading partners. Despite the tougher tone in Europe, the preferred course is one of dialogue and cooperation with China. Though many European leaders share the Trump administration’s concerns about Xi’s China, they would rather leave the “tough guy” business to him. No, Europe is not only not tough enough but lacks EU-wide understanding of China’s threat. China’s rejection of rules-based politics, its discriminatory business practices, and statist economics hark back to the Soviet rejection of Western values following the division of Europe in the 1940s. Back then, the misery of communism had served as a wake-up call to those wavering in their support of transparent economics and democratic accountability. Today, China’s relative economic success blunts its disruptive agenda. Europe cannot have a cake and eat it. If China undermines the very essence of Europe’s security and prosperity—disrupting maritime peace in Asia, promoting standards at odds with liberal business practices, and chipping away at rules-based conduct—then Europe cannot treat the country as any other “close business partner.” The U.S. clash with China is about pushing back at the very forces that undermine EU’s long-term prosperity and peace. There is no middle ground here: if the United States and the EU support the same house of rules, then both sides must close ranks quickly to check China’s disruptive policies. Transatlantic partners should offset the siren call of China’s growing market with the cold-blooded rationale of defending the rules upon which their alliance has successfully delivered over many decades. Probably not; but can Europe really afford to be tough on China? With the transatlantic relationship increasingly strained, the EU needs heavyweight allies on some of the bigger policy challenges like climate change. Like it or not, Europe needs China on board to advance these global issues, especially at a time when the European project itself is under heavy pressure from within. The economic incentives for Europe are also hugely enticing. China, for all intents and purposes, still has deep pockets to invest overseas, and it’s difficult to turn away such advances despite the implications they bring. Indeed, it hasn’t always been rosy for countries on the receiving end of such overtures, as we’ve seen in Central and Eastern Europe. But it’s also equally difficult to turn away from the potential resource and employment opportunities such investments offer, despite all the drawbacks. And while China’s questionable human rights record should be raising red flags for Europe, which puts so much emphasis on values, the EU’s lack of a consistent approach in its external relations leaves a lot to be desired. The reality is that Europe can’t afford to lambast China when it remains mute on Turkey because of the migration deal. Could Europe be tougher on China? If the EU managed to get member states to agree on a common stance, then probably—but then to what end and for what purpose? In short, it’s about the EU lacking any coherent strategy toward China. In principle the EU is not tough enough on China, but this reflects the nature of the EU as well as the formidable leverage China uses to divide the member states. The fact is that it is now impossible to pass a critical resolution on almost any aspect of China’s policies because Hungary will exercise a veto. So we come back to the organization of EU foreign policy that requires unanimity. It is difficult for the EU to play the values card when we have Hungary and Poland trampling over media freedoms and the rule of law. It is also very difficult to be tough on the second-largest economy in the world when the economies of many member states have been stuttering in the past decade and Beijing has been promising massive investments. As China’s largest trading partner, the EU could and should have been tougher much earlier on China’s mercantilist approach. At least now there is a growing recognition, especially in Germany, that there must be changes in relations with China. But with President Xi due in the coming weeks to visit France and Italy, two member states that have invested heavily in relations with China, it will not be easy to forge a tougher EU line. The EU is working with the United States and Japan in trying to resolve some China trade issues, such as steel overcapacity. But with the Trump administration alternately bashing China and the EU, one cannot be optimistic about a common transatlantic approach on China. In short, do not hold your breath about any major change in EU policy toward China. The EU has become tougher on defensive issues but is not in position to be tough on Europe’s more offensive interests, such as the promotion inside China of European core values. This change in the EU-China offense-defense balance is redefining the dynamic of the relationship. The EU’s China agenda is undeniably in the process of becoming more defensive. The recent adoption of trade protection measures and an investment screening system are milestones in this transformation. That the European Commission was able to spearhead rapid change on issues that were previously subject to ideological differences between protectionist and free-trading reflexes points to how the EU’s China policy is no longer about expanding the scope of interactions, an approach that seemed to be in the EU’s DNA. It has shifted to protecting Europe from the exploitation of systemic asymmetries by China. Next on the agenda might be a more restrictive turn to regulate technology transfers and more attention on China’s influence in Europe. This shift to a more defensive approach is a response to the successful effort undertaken by China under Xi Jinping to insulate the country from foreign influence. Building defenses seems rational when there is little space for a positive agenda and the balance of power is changing. From an economic point of view, the question is more or less irrelevant. In 10 years of continuing crisis since 2008, as a result of its failure to generate growth internally, EU economies and major companies have become increasingly dependent on external demand—the most important source either through exports or foreign investment being China. The EU is once again facing failing growth or recession, possibly worse. The key questions are first, can China yet again bail out EU economies and companies through demand creation? And second, if yes, will it be willing to do so? All other economic issues such as investment screening are of marginal importance for the real problems of the EU, although it is likely that a recession in the EU will increase pressure for either greater defensive protectionist policies vis-à-vis China or greater offensive demands for market access. In its bargaining position with China the EU had a brief window of opportunity based on its relative strength when economically it was enjoying fairly healthy growth and politically the Trump administration pushed China into seeking compromise with the EU. But as the EU falls closer into recession and the U.S. economy also weakens, that window is closing. When I talk to European ambassadors in Beijing, they often say they have serious misgivings over President Trump’s foreign policy. But on China, they are watching with great interest and hope that Trump is successful in his trade negotiations because Europe would also reap significant benefits from a more fair and level playing field with China. Like U.S. leaders, European leaders want to see China improve its protection of intellectual property, abandon the practice of forcing foreign companies to transfer technology to Chinese JV partners, open up Chinese markets to other countries (i.e. greater reciprocity), and eliminate the subsidies to Chinese companies that puts foreign companies at a disadvantage. The German and French ambassadors to China published an article in Caixin last November calling for China to implement a “more holistic reform agenda to increase international investment and resolve the existing challenges.” This reemphasized messages from French President Emmanuel Macron, British Prime Minister Theresa May, and German Chancellor Angela Merkel during state visits in 2018. As both Europe and the United States have alignment on many of these concerns, it is important to find ways to coordinate messages in pressing China to make changes. The Trump administration’s instinct to go at it alone feeds into misleading narratives in China that Trump’s pressure is simply part of a U.S. effort to contain China and block its further rise. This narrative is convenient for Chinese leaders because it absolves them of acknowledging any role that China’s own policies and/or lack of real reform have had in generating increased global trade tensions. This kind of narrative also dismisses legitimate grievances by the United States and Europe. Greater alignment between the United States and Europe could help counter such narratives and increase the possibility that China will respond to international concerns with more urgency and sincerity. Europe is only beginning to get serious about China as a full-spectrum superpower. 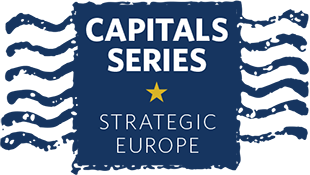 Hi-tech takeovers in Europe or mandatory IPR transfers from European firms investing in China; debt-equity swaps through the bankrupting of weak states such as Montenegro; cyber-operations and big data capture; political pressure to prevent the adoption of meaningful EU-wide policies on technology control or on the implementation of the law of the sea in the South China Sea: these growing problems are increasingly recognized by the European Commission and a number of EU member states. What remains barely understood is that over the coming decades the United States’ willingness to ensure Europe’s security will become a direct function of whether the Europeans are seen as supporting or countering Washington in its strategic competition with Beijing. NATO beware! around half of the EU’s trade with the world passes through those international waters claimed by China. Europe has become tougher on China, but it could be even more so. After several decades of wishing that China was going to move in Europe’s direction, including more political reform, there is disappointment in most European capitals and at the EU level. Xi Jinping’s China is not opening up, and the regime has become more repressive across the board. On the economic front, European companies are starting to speak openly about their frustration. As China becomes a global investor, its own market remains fairly closed to foreigners in a large number of sectors. There is no reciprocity, and European executives are unhappy with the role of state-owned enterprises as competitors in China and elsewhere. They don’t see it as a fair game, especially as some Chinese companies have benefited from the largesse of state banks or funds while their own development depends on market rules. Perhaps because they are stronger than other member states, Germany and France are the two countries at the core of a new EU screening mechanism aimed at protecting European technological brands and key infrastructures. Eastern and southern European governments have been more reluctant to criticize Beijing and are opening the doors to Chinese investment and influence. Regarding 5G, there is mounting pushback against Huawei, including from Germany, the Czech Republic, and the UK. Poland has also just arrested a Huawei executive, allegedly a spy. Huawei is arguably having a very bad year so far. Where do we go from here? In its recent “Policy Paper on the EU,” China does not show any sign of compromise, delivering a list of demands to Europe regarding Taiwan, Hong Kong, human rights, the South China Sea, and Tibet. In Europe, Beijing runs the risk of losing traction, even with those who have supported a strong China engagement. What we need is not a tough Europe but a smart and unified Europe. First, the EU is highly interested in the peaceful international order and cannot afford to lose China as a potential partner in global governance. Second, Europe—weakened by the Brexit and populism—is simply not powerful enough to be really tough on China; besides, external pressure usually makes Beijing even more adamant. China, meanwhile, already feels the impact of its worsening relations with the United States, and this makes Beijing more willing to increase its cooperation with other international partners, such as the EU. Brussels should grab this opportunity and utilize its current, advantageous position to rearrange its relations with Beijing, without alienating the country. Bargaining is well known in China, and Europe now has the chance to negotiate on issues like Chinese investment in the EU, establishing a level playing field, and intellectual property rights. But is Europe tough enough on its own members to forge a viable unified China policy? I doubt it. Undoubtedly, Europe is becoming tougher on China. There are several examples. Investment screening is the best one. Particular countries are getting tougher as well, expanding national screenings and reconsidering relations with China in terms of high-tech cooperation. This shows that the security concerns are similar in the EU and the United States. The process of setting up the screening at the EU level was taking place at the same time as the CFIUS reform (Committee on Foreign Investment) in the United States. Europe is also becoming more a vocal critic on human rights; take, for example, the recent situation in Xinjiang. Moreover, the EU does not believe in Chinese “lip service” about market openness. But is Europe tough enough? The EU is as tough as it can be under the current circumstances. There are two reasons for EU-like toughness. The first is the EU mindset, which could be called a “cautious engagement.” This means that the EU would like to cooperate with China, but needs defense mechanisms to make cooperation safe and fair. The EU does not intend to isolate or “decouple” itself from China, an approach promoted by the Trump administration. The second reason is the EU setup: member states pursue different policies toward China. The fact that countries were able to set up the screening and China would like to cooperate with the EU means that the “defensive engagement” may work. Asking this question seems to imply Europe should act like the Trump administration and start its own trade war with China. This does not fit with Europe’s more traditional, “soft power” approach. Moreover, the diverging attitudes between union members when dealing with the many Chinese initiatives are preventing such course. The “every nation for itself” policy, so obviously dispelled by EU members when confronted with the challenges of the Belt and Road financing, Chinese direct investments in European companies, or technology transfers, offers not much ground for any show of strength against Beijing. Even the recent adoption, after a long protracted debate, of the EU monitoring system for foreign direct investments leaves the final say on such investments to the member states. Yet the EU, as China’s largest trading partner, possesses a significant leverage. It is already using that asset to achieve substantial agreements on investment protection and geographical indications. Europe should stick to that course, which is more in line with its DNA, and insist on transparency and fair competition. Additionally, this less confrontational profile stands a better chance of uniting all European nations around a “level playing field” approach they all can endorse—and which China cannot overtly dismiss. Without a doubt, the European Union has and continues to struggle to stand up to China. There are two main reasons for its difficulties: First, Europeans have never before faced an actor with whom they had such close economic ties and which yet posed a threat to the liberal international order that forms the foundation of their prosperity and security. Second, all decisions related to the EU’s Common Foreign and Security Policy (CFSP) remain subject to unanimous agreement. The ability of Brussels to stand its ground internationally therefore heavily depends on its unity. Smaller states reliant on Chinese investments have used their veto right to scupper EU efforts to take a tougher stance on China. That said, the tide may be turning. As the West reevaluates its position towards China, the European discourse, too, is changing: far from the unfettered enthusiasm of the early 2000s, Europeans have become more critical of Beijing’s growing influence. This newfound skepticism gave rise to last year’s agreement on a foreign investment screening framework, and the increasing calls for a shift towards qualified majority voting on CFSP matters suggests that Brussels has identified some of the structural issues underlying its comparative weakness as an actor in international affairs. In a framework of global finance, European countries should surely join with others to press for a review of the multilateral rules/norms that are failing to govern them effectively and threaten conflict. Many countries have serious criticisms of the old system of finance, including lack of enforceability and most recently the UN's World Bank.